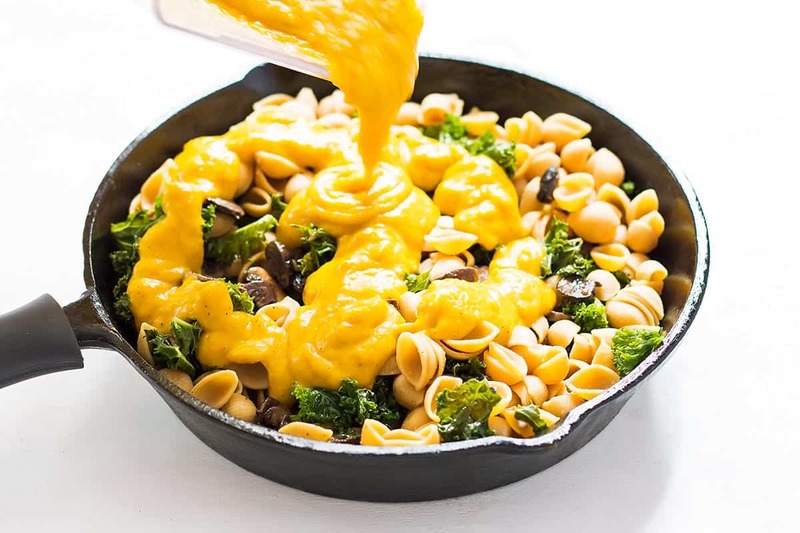 A pan of creamy, hearty comfort food – this Vegan Pasta Bake is an exciting twist on baked pasta. It has mushrooms, kale, a creamy butternut squash sauce, no cheese, is gluten free and of course vegan! 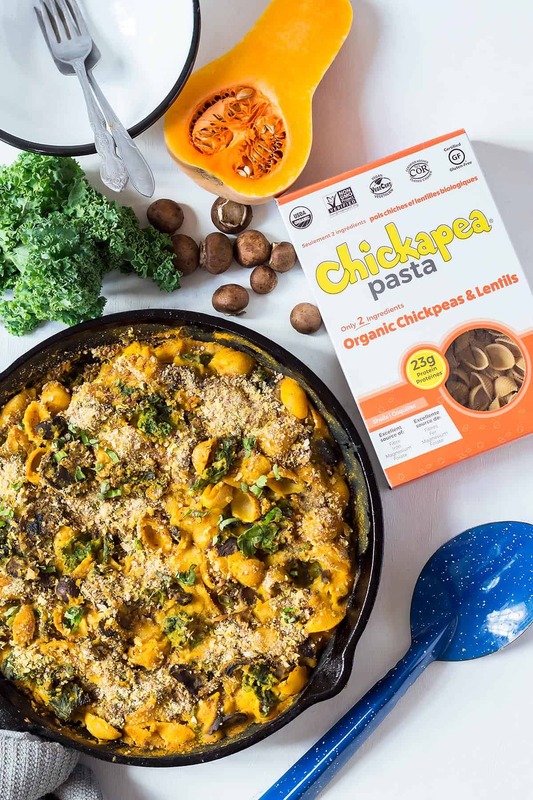 After the gluten free Pesto Pasta Skillet I am partnering with Chickapea again to bring you a gluten free and vegan recipe today. 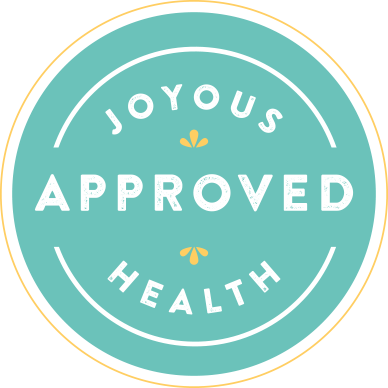 Unlike some other gluten free products that are full of unpronounceable ingredients, Chickapea pasta is made of only 2(!) ingredients – namely organic chickpeas and lentils. They come in shell, spiral and penne varieties. And Chickapea pasta is delicious and quick to cook. Combine it with your favorite pasta sauce for an easy meal or turn it into this vegetarian pasta bake. Do you need to boil pasta for pasta bake? I am all for shortcuts and making things easier around the kitchen. But let me tell you that unless you are using special no boil pasta, pre-cooking the noodles for a baked pasta dish is a step you don’t want to skip. Take this from someone who has had crunchy noodles in a pasta casserole before. It wasn’t a very pleasant texture. So yes, pre-boil the pasta but you want to seriously undercook it. With this Chickapea pasta I’ve found 3-4 minutes to be perfect. At that point the pasta will only just start to soften. Give them a quick rinse under cold water at this point. This will stop the cooking process and will also make the pasta less sticky/clumpy. Once you combine the precooked noodles with sauce and veggies they will continue to cook to perfection in the oven. Making creamy vegan pasta sauce requires a little trickery. Since actual cream is out of the question, I rely on the help of vegetables to create that creamy texture and flavor. Inspired by my vegan cauliflower alfredo I made a butternut squash pasta sauce for this casserole. Butternut squash is a delicious seasonal vegetable that turns into creamy magic when cooked and blended. It also looks like a mac and cheese sauce. So I fully embraced that by adding nutritional yeast to the sauce for some vegan ‘cheesiness’. Caramelized onion and garlic give it some depth and rich sweetness, while a little turmeric enhances the yellow color of the sauce. 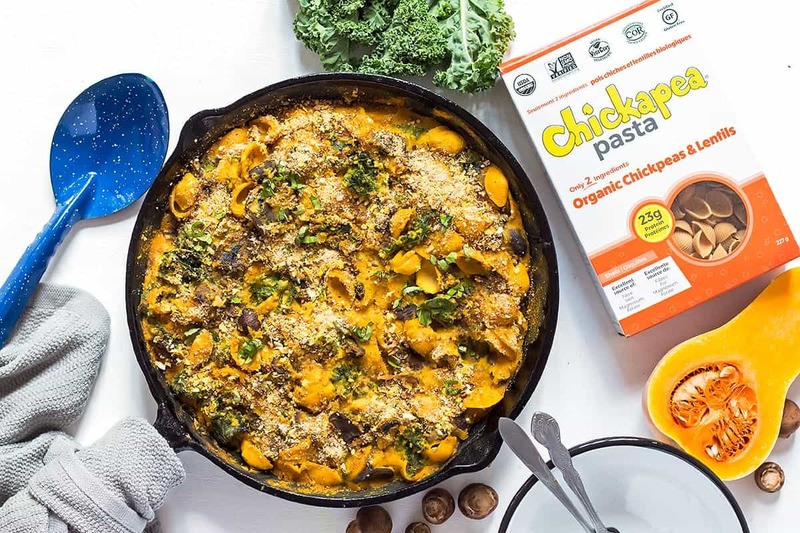 A cheesy topping seems almost inevitable for a baked pasta dish, and of course you could sprinkle shredded vegan cheese over the top of this vegetable pasta bake. But breadcrumbs are another popular casserole topping and they are inherently vegan already. Choose gluten free breadcrumbs to keep this recipe gluten free. If you don’t stock gluten free breadcrumbs, they are really easy to make yourself. Simply toast a slice of gluten free bread and grate on the side of a box grater. Use the side with bigger holes for coarse breadcrumbs. I combined the breadcrumbs with a little more nutritional yeast for a little more cheesy flavor, but that is totally optional. Once I spread the breadcrumb topping over the pasta, I gave it a quick drizzle of olive oil. This makes the breadcrumbs extra crunchy during baking, which is a great texture contrast to the rest of the dish. I like to save on dishes by using my cast iron pan – first for caramelizing the onion, then sautéing the mushrooms and kale, and finally to combine everything in there to bake in the oven. If you don’t have a cast iron pan or other oven-safe pan you can of course use a separate casserole dish to bake everything in. Caramelizing the onion and garlic may seem like it would take forever (~20 minutes), but it’s so worth it for that rich roasted and sweet flavor and totally hands off. While the onions caramelize you can pre-boil the pasta, cook the butternut squash and chop and prep everything else in this recipe. Any leftover pasta bake can easily be reheated in the microwave or on the stovetop on low heat with a touch of water added to the pan. Thank you to Regina of Leelalicious for another creative dish with our pasta. For more tasty recipes from Regina check out her Facebook and Instagram feeds! Loving Vegan, Gluten-Free Pasta Recipes? Heat 1 tablespoon of olive oil in a pan. Add the onion and garlic slices and sauté covered on low heat until caramelized (about 20 minutes). In the meantime bring a large saucepan with at least 2 liters (8 cups) of salted water to a boil. Add the butternut squash cubes until fork-tender (7-10 minutes). Transfer the butternut squash to a blender with a slotted spoon while reserving the water. Bring the salted water back to a boil and add the Chickapea pasta. Bring the water back to a boil and cook the pasta for 3-4 minutes until just starting to soften. Drain pasta, rinse with cold water and set aside. By now the onion and garlic should be caramelized. Transfer them to the blender with the butternut squash cubes. Add almond milk, vegetable broth, 2 tablespoons nutritional yeast, salt, turmeric, and black pepper. Blend until smooth and set aside. Add the minced garlic, season with salt and pepper, and cook for a minute. Add the kale, close with a lid and steam on low for 5 minutes. Remove the lid and take the pan off the heat. Add the cooked pasta and blended sauce. Stir to combine. 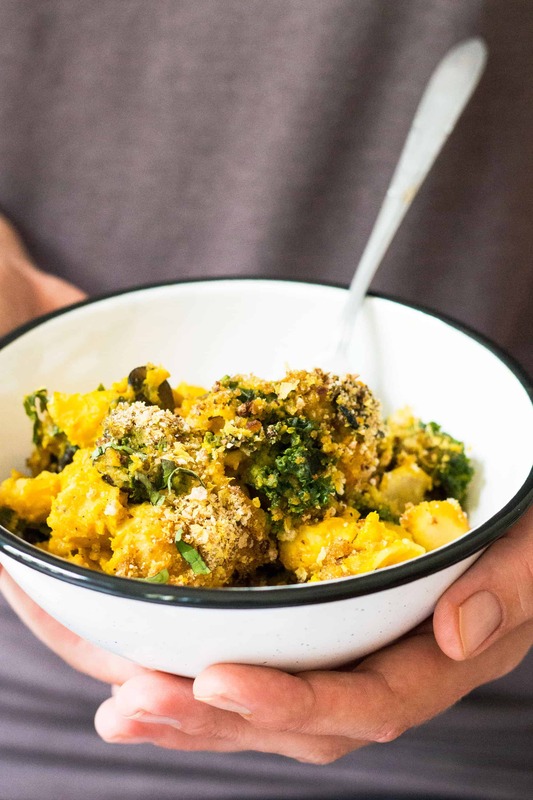 Combine the breadcrumbs with 1 tablespoon of nutritional yeast. Sprinkle the mixture over the pasta bake, then drizzle a little olive oil over top. Bake at 350°F for 20-30 minutes until heated through. Top with basil ribbons after baking. Could there a more perfect fall meal for my family? Healthy, fiber filled, and loaded with veggies! This looks fantastic! Love that it’s a full vegan meal with protein and veg!! This looks incredible! It’s hard to find a good vegan recipe with a decent amount of protein, but with the help of Chickapea Regina made that happen! Thanks Sarah! We love our protein! Just looking at these pictures is making me hungry! I made a similar type thing last week with Chickapea and it was so good – I bet this recipe is even better too! Can’t wait to try it! Pasta Bake just got healthier and tastier! Love this recipe! So so delicious! 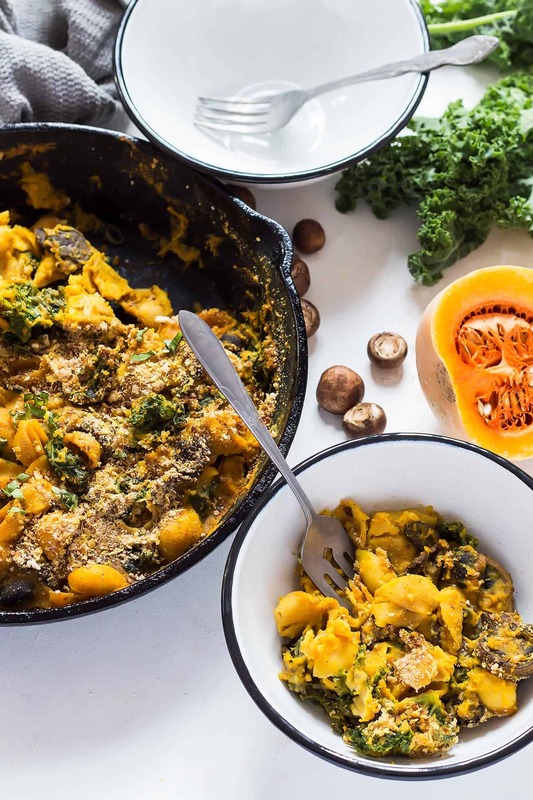 Kale, mushrooms, butternut squash — all scream fall! Right! Love the fall veggies!! 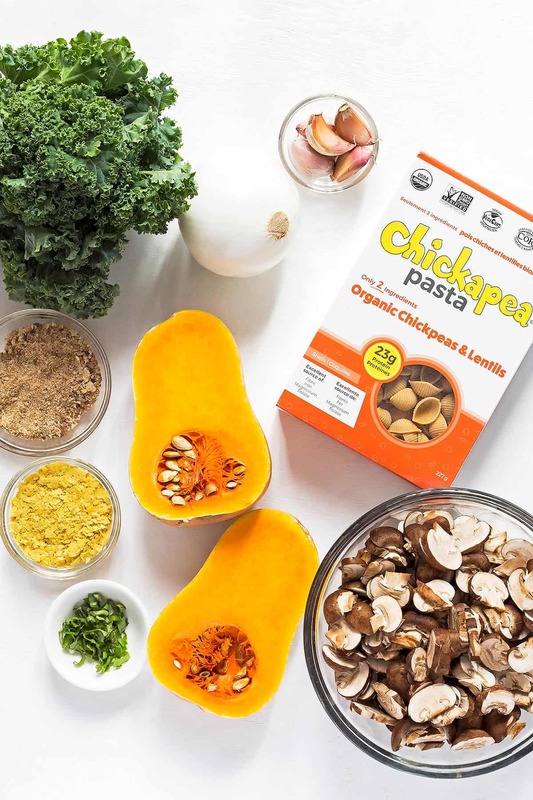 That butternut squash sauce sounds perfect for that hearty, healthy Chickapea Pasta! We love the combo too, Marcie. So great for fall! This is such a great recipe! I love how creamy it is without having any dairy in it. Amazing! Such a tasty and easy sauce, Kristen! I want to attack that entire skillet! So in love with every little aspect of this dish: the healthy creaminess, the mushrooms, and the nutty, wholesome pasta. We love the earthy flavor of the kale and mushrooms with these fabulous flavors, Dana! I love creamy butternut squash sauce with pasta! And so many other delicious veggies in there too! Us too! Nothing like fall veggies any way you can have them! I love that it’s gluten free AND vegan-friendly! I love a good vegan pasta recipe… and baked is even better. Our pasta bakes up so wonderfully too! So glad you like this, Natasha!